Store International Distributional Choices in EU Climate Change Law and Policy: Towards a Principled Approach? 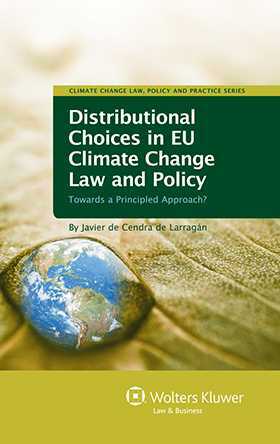 Distributional Choices in EU Climate Change Law and Policy: Towards a Principled Approach? Climate change policy inevitably has two core components: the goals, and the means chosen to pursue those goals. Decisions on goals and means necessarily have distributional consequences. Any policy choice generates winners and losers. While this outcome cannot be avoided – even doing nothing leads to distributional consequences – policymakers can, through the choice, design and implementation of policies, shape to some extent the distribution of the burdens of mitigation and adaptation to climate change. In greater depth than any previous legal study in the field, this book deals with the way in which the European Union (EU) has dealt with climate change and with the distribution of the benefits and costs of climate change mitigation policies among affected parties. With extraordinary thoroughness the author assesses the legality of choices made (particularly concerning mitigation targets and timelines), and examines the role that legal principles can play in the adoption, interpretation, and judicial testing of distributional choices. His analysis of the tension between such choices and EU law is bolstered by an exploration of emerging legal principles which could provide additional guidance in this challenging and controversial area. A concluding chapter offers deeply informed recommendations regarding the design of EU climate change law, including a preliminary assessment of EU wide personal carbon trading. In its insightful illumination of how the inevitable trade-offs, weaknesses, inconsistencies and ambiguities in the way law deals with distributional choices renders them vulnerable to external pressures, this book will be of enormous value to regulators and policymakers concerned with effective, efficient, and fair climate change measures. As a critical assessment of existing EU climate change laws and policies, and as a systematic analysis of the problem of burden sharing, this book will also prove highly valuable to academics in environmental fields of study. List of Abbreviations. 1. Introduction. 2. Climate Change, Climate Change Policy, and Distributional Choices. 3. Law, Legal Principles, and Distributional Choices. 4. Legal Principles of EU Law Relevant for Describing, Assessing, and Testing Distributional Choices in Climate Change Law and Policy. 5. The EU Approach to International Burden Sharing: An Analysis from the Perspective of Legal Principles. 6. Effort Sharing between Member States in EU Climate Change Law and Policy: An Analysis from the Perspective of Legal Principles. 7. Distributional Choices in EU Climate Change Law and Policy: An Analysis from the Perspective of Legal Principles. 8. Distributional Choices in EU Climate Change Policy: Towards a More Principled Approach?